I follow a knitting group on facebook. 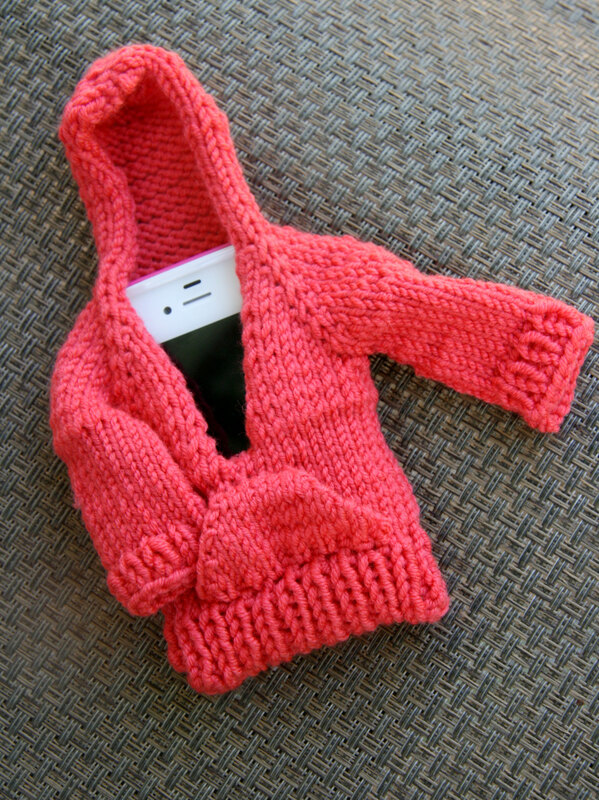 The other day someone posted a picture of an iphone hoodie. I had to go find the pattern immediately. I went to my stash, picked out some yarn, and knitted this right up. Cute cute cute. I loved it. My purse is like a bottomless cavern, so this also helps me locate my phone more easily. This is a fun easy knit. Davey, David and I have been doing several crafts this summer. Our success rate has been pretty good, but we tried a craft the other day that just didn’t work. It was one of those 3d foam projects. 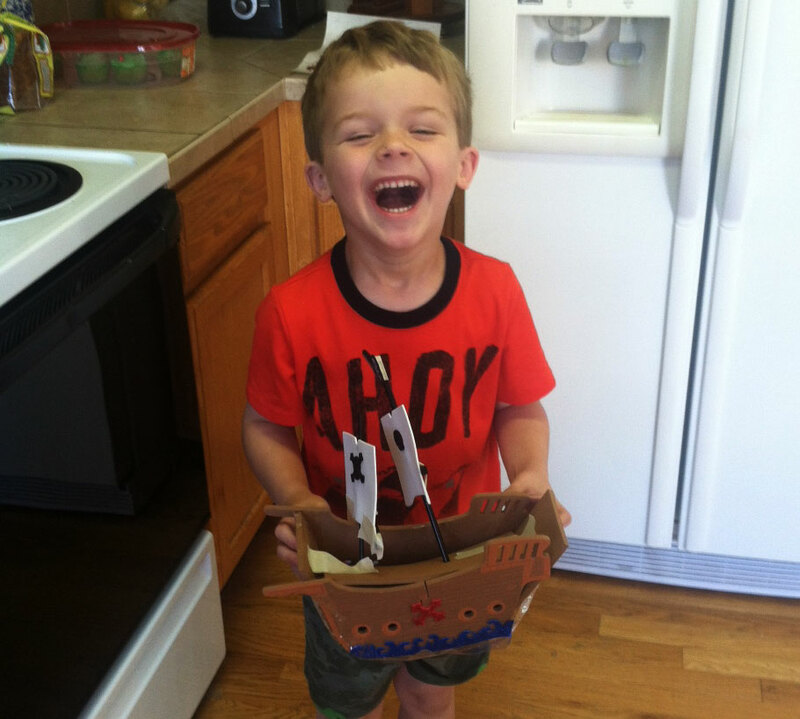 We were supposed to make a pirate ship. This required glue. So the tricky thing was that we were supposed to connect the sides of the ship with a piece of foam which was also the bottom of the ship and then curved up to be the front. So we had the foam glue. We carefully applied it and then held it in place. and held it. and held it. 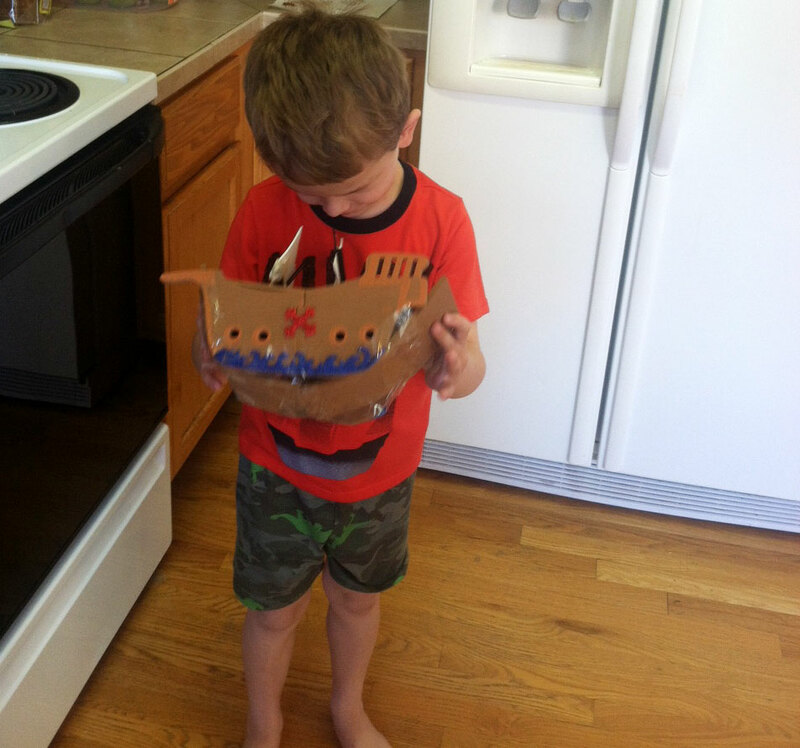 The craft was designed for ages 6+. Two 45 year olds were holding it in place. One of them was saying “this will never work. this is not going to work.” He was right, but I couldn’t stand to just give up. We needed Super Glue to have a prayer, but Super Glue over a fairly large project seemed potentially hazardous. So finally we gave up. I told Davey that we were just going to have fun with it. So we have lots of packing tape right now. Davey and I just taped the heck out of that ship. It looked terrible. It’s supposed to have about six billowing sails. I love Davey’s expression as he gazes at it. He is developing a great sense of humor. He makes us laugh all the time. So it was a craft fail pretty much in the sense that it looked terrible, but we had a great time, so I guess it was actually pretty successful! This entry was posted in Crafts, Knitting by cpeezers. Bookmark the permalink. That smiling face says it was a GREAT success. Sometimes it’s the process, not the end product. Bet he ends up playing with this one more than if it were perfect. It looks like a great pirate ship for an imagination to take run!